Ronald Reagan’s autographs, signature and signed letters range from movie star pieces from his Hollywood days to his time in Sacramento as Governor of California to the White House. It was the unique journey of a unique personality who in recent years has seen the ranks of his fans grow with many appreciating his bipartisan attitude after the political debate of the day. A chorus of those seeking a return to the days of conservative political values has been joined by those just seeking the days of civilized debate. 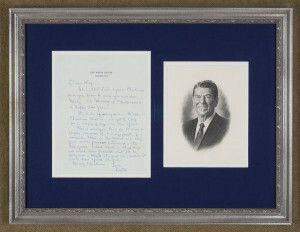 The popularity of Ronald Reagan’s autograph, signatures, signed letters is very high. The number of genuine autograph pieces is not as great as such a long and varied career would indicate. From Reagan’s early movie career his fan mail was answered in longhand by his mother. They shared many handwriting characteristics, which are common, but his mother seems to have carried on correspondences with Reagan’s friends who did not know that he was neither dictating nor writing the letters. These are very difficult to distinguish from genuine letters. This habit of having someone else sign letters, frequently of a personal nature, became a pattern throughout his life. Ronald Reagan handwritten autograph letters written while running for Governor, as Governor of California and while running for President are occasionally available and are both amazing in the expressions of his down to earth political philosophy and in his not sending these handwritten drafts to his recipients. Instead, these handwritten drafts were given to his secretary who then typed the letters and affixed a robot signature according to the form specified by Reagan. Ronald Reagan’s autograph and signature alone, usually signed in person as a movie star, are not as plentiful as fans would imagine. All of the Ronald Reagan autographs, signatures and signed letters we offer for sale are unconditionally guaranteed genuine. Our guarantee is backed up by over 50 years expertise and authorship of the standard reference book Forging History, The Detection of Fake Letters and Documents. Please browse our selection of Ronald Reagan autographed memorabilia or you may search our entire inventory alphabetically, by name, or by category.